As a culminating lesson, I held an interactive lecturette with my students, where we summarized what we have learned the first two chapters of the Learner’s Material for Grade 7 Science. This video shows a very similar process of electrolysis we did in the lab, except that we used NaOH instead of NaCl and we obtained Oxygen and Hydrogen, instead of Hydrogen and Chlorine. This is another video showing a very simple way of performing electrolysis using a 9-V dry cell. 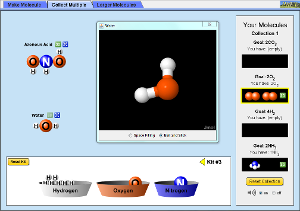 Here is a simulation where you can build molecules by dragging atoms of various elements. When you click the image below, you will be asked to download a java simulation. If you have na updated Java Runtime Enviroment, you will have no problem opening the jnlp file that you will download. If not, you will have to download an updated JRE from Java.com. The simulation above is fun way to solidify the learnings of students about elements and compounds. There are more simulations at the PhET Website for you to explore.